I’m sure you’ll agree that a jigsaw must have enough cord length, cutting capacity, and be easy to handle. That was our top criteria for selecting the best jigsaw. If you want to cut through the data and get cutting with your saw, Makita 4350FCT Jigsaw beat out the competition in all categories and is our top pick. We have spent hours talking to experts in the field who use these tools and we’ve spent time researching the internet and other places about what you should look for when purchasing a jigsaw. We have covered all the points for you and have taken the guess work out of finding the best jigsaw on the market that will fit your needs. In this review you’ll discover the top 3 jigsaws that are getting a lot of attention and why they’re so popular. We’ll also go over what to look for when it comes to the features of different jigsaws and what is important to have in the one you choose. You won’t have to go from site to site, scanning a bunch of different jigsaw reviews, because we’ve done all that for you and compiled an all inclusive resource that will give you a lot of insight into which jigsaw is the best. We know how confusing it can be to understand what makes one jigsaw better than another, especially if you are new to using them. We are passing all this valuable information on to you, in one place, so you can spend your time comparing and deciding which one you will get, not trying to hunt down the information you need. Our goal is to help you become informed about jigsaws in terms that are easy to understand and enlightening too. Read on to learn about these great tools and what they can do. 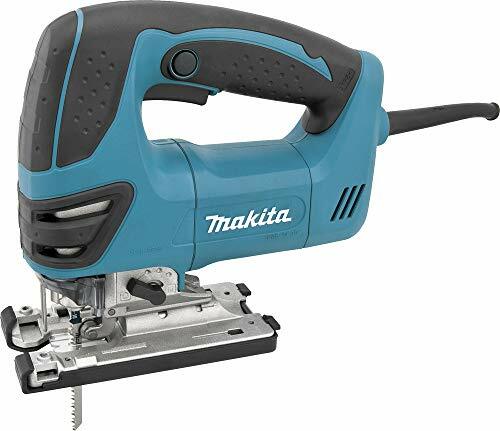 Another great jigsaw that makes it into the top three on many review sites is the popular brand Makita 4350FCT. The rubberized grip on the popular top handles gives the user great control and comfort with its ergonomic design. There is a “tool-less” blade changing system that makes installing and removing the blades fast and easy. You have excellent visibility with the on-board LED light, making seeing the cut lines much easier on the eyes and ensuring a perfect cut. Adjusting the bevel is fast and accurate with the on-board hex wrench. You’ll experience consistent speed all the way through your cuts with the electronic variable speed control dial that ranges from 800-2800 SPM. You’ll be able to cut through a variety of materials with the powerful 6.3 AMP motor with 3 orbital setting and straight cutting. What are customers saying about the Makita 4350FCT? Customers love the Makita 4350FCT. One user says that they have used about every jigsaw made and the Makita 4350FCT tops the list and is his favorite. Another user loves the LED on the front which really gives a lot of extra viewing power. Exuding power, durability and precision, this Bosch JS470E is perfect for the professional or the DIY-er. What makes this jigsaw rank in the top three on many review sites is the industrial design that helps it withstand the roughest jobsite conditions without losing power or accuracy. Durability is important on the jobsite and users want to know they can depend on their tools to be working correctly when they’re needed. This jigsaw does that and more. It’s precise and accurate cuts make It a shop favorite. It is top amp rated with a 7.0 AMP motor providing tons of power along with the no load SMP that ranges from 500 up to 3,100 and has up to 60 hertz. This gem can cut mild steel (3/8”) aluminum (up to 7/8”) and wood (5 and 7/8”) with ease. It can be adjusted from four different orbital – action setting which allow you to find the right blade for your cuts whether they are smooth or aggressive. 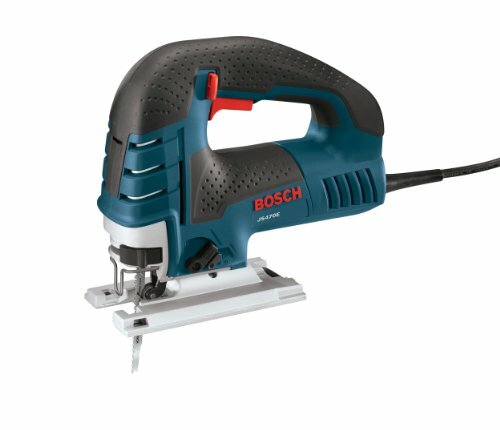 What are customers saying about the Bosch JS470E? Customers love the solid feel and precise cuts that this jigsaw provides. One user expected it to give him problems and was astounded at the excellent cuts and ease in which the jigsaw handled curves as well as straight cuts. Despite a few reviews that state the Bosch JS470E will not cut a 45 degree angle, this has been proven over and over by many users to not be the case. In fact the saw will cut at a slight 48 degree angle as well and does so with precision and ease. It’s a big favorite with many and they use it for many projects. The variable speed setting dial on the back is a user favorite along with the variable speed trigger makes cutting through knots and material of varying thicknesses a simple task. 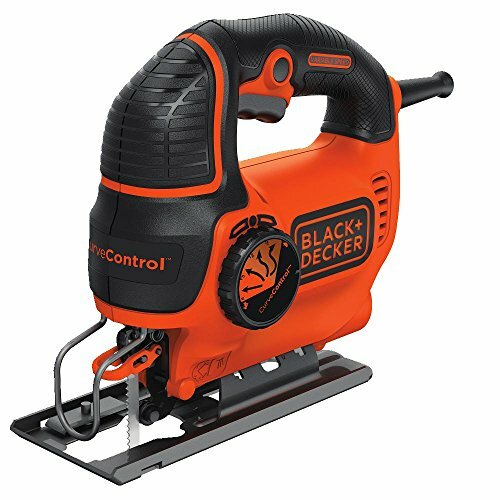 The Black and Decker JS660 is a top pick, ranking on several review sites in the top 3 as well as being a best seller on Amazon. One of the reasons this great jigsaw is so popular is that it takes the guesswork out of making the right cut with the Smart Select feature, which makes it a great choice for less experienced people as well as making quick work of cuts for more seasoned woodworkers. In addition you have individual speed control on the handy variable speed dial for any custom applications you are using. You’ll love the quick clamp tool and free blade change that offers easy blade changing for both the T-shank and U-shank blades. Add in the easy to set accu-bevel with vision window which allows you to set the jigsaw at several different degree settings, as well as left or right precisely for nearly perfect beveled cuts every time and you have a tool that you need to add to your workshop. What are customers saying about the Black and Decker JS660? Many users love the ease of use this great jigsaw provides them. One user says they use it for tons of projects around the house. Others love the simplicity of changing the blades and the fact that it has great power. Most remarked how strong it is and that it fit their projects perfectly. No matter what you project is you’ll love the fact that it doesn’t require any tools to change the blade and it cuts wood, plastic and even metal, cutting in curved and straight lines. Users love how simple it was to handle and learn the functions on as well. It’s a perfect choice for new users and experienced users too at a great price. Even professional woodworkers and carpenters love the precision and ease of use that this jigsaw provides. A favorite feature is the motor air discharge that takes care of the dust from cutting. It’s a definite top contender for anyone looking for the best jigsaw they can buy. The three top jigsaws we’ve outlined above for you are all excellent choices and rank in the top three on many review sites. All of them are customer favorites with professionals and newbies alike and depending on what your projects are any one of them will help you get the jobs done accurately, easily and precisely. Whenever you have intricate patterns and curves to cut, a jigsaw is going to be your “go-to” tool. The smaller construction of the jigsaw lends itself to being excellent for using it for those more precise and smaller cuts that some projects call for. Although it can often be associated for more of an artsy type of tool, the power and versatility of these tools make them great choices for all types of construction projects. The jigsaw dates back to the 1940s when a Scintilla AG engineer that worked for the Swiss company, replaced his wife’s sewing machine needle with a saw blade so he could make intricate cuts in wood. The success of this maneuver sparked the creation of what would turn out to be the modern jigsaws we have today. The versatility of the jigsaw makes is a favorite among woodworkers, carpenters, construction workers and DIY-ers. Different models have different capabilities so depending on what it is used for that will determine which one would fit that particular project the best. What kind of Materials can be Cut? The most common material that jigsaws are used for is, of course, wood but depending on the type of blade that is used, jigsaws are very efficient and good at cutting metal, plastic, paper and ceramics too. Just be certain to that you have the right blade for cutting these other types of materials. What Type of Cuts can be made? More often than not, jigsaws are used to cut curves. That includes intricate patterns and circular cuts as well. The ability to do this makes the jigsaw perfect for arts and crafts. It is also a favorite tool for carpenters who want to make intricate designs on their furniture. For use in the construction world, they are perfect for when a hole is needed in a countertop for a kitchen sink to be installed. Due to the way the saw works, one a hole is started in the center, the jigsaw can be used to cut out the opening for the sink. It’s a much easier and efficient way to cut this hole out rather than having to start from the end. The name for this type of cut is called a plunge cut. Even though jigsaws are most often associated with curves, they are great for straight cuts as well. This is not necessarily their strong point though and sometimes a guide may be required to get a straight, accurate straight line. The more experienced the user is with handling a jigsaw the less trouble they will have cutting a straight line but there is some learning involved. Another type of cut that jigsaws are used for us called a bevel, or angled cut. Many jigsaws include the capability of having the blade tilt to be used for these types of cuts. This feature works great for cutting miter joints in the construction industry. Different jigsaws have different features and capabilities, so which one you choose really depends on the types of jobs you will be using it for. Many professionals have several types that can handle different functions just to cover all the bases. Outlined below are the different types of jigsaws available. There are three types of power options that jigsaws have: Corded, Cordless and Pneumatic. Each of them has their benefits and disadvantages. Mostly it comes down to personal preference but there are some projects that not being restricted to a cord can make much easier. Corded: These jigsaws are powered by electricity. They are extremely powerful and work well when cutting thicker materials. How thick will depend on the type of blade and the model jigsaw you have. When you’re using a corded jigsaw one of the biggest factors is safety. If you’re not being careful it’s very easy to have the cord get in the way and cut it accidentally. Water damage can also be very dangerous; both of these concerns can cause electrocution. Cordless: Cordless jigsaws are great for the portability factor but they tend to not be as powerful as their corded counterparts and they are also heavier than corded varieties which can become tiresome when working on long projects. Many people like the fact that there is no cord to worry about but you’ll have to make sure that they are charged fully and then if the charge runs out before the project is done, you will have to wait until it is recharged before you can resume your projects. People love the convenience of cordless jigsaws but dislike the fact that the batteries can run out quickly. Users who get cordless jigsaws may opt to buy an extra battery to avoid delays in finishing projects. Pneumatic: Although these may not be as widely used as the two varieties above, pneumatic jigsaws have many pluses that make them a good choice. They are usually lighter than corded and cordless choices and are much safer to use in damp areas. They are very powerful and don’t take power to run so you can use them in areas where you may not have power once your air compressor is charged. How many AMPS does the it have? AMPS are another factor that has to do with the power a jigsaw has. The higher the AMPS the more cutting power your jigsaw will have. If you saw has 5 amps or more, they can be used for heavy-duty work and for cutting materials that are thicker. Save the lighter jobs for jigsaws with 3 or 4 amps. Changing the blades on your jigsaw can be done in several different ways. Many have a quick-release option that makes changing the blades fast and easy. Other types of jigsaws may require tools to fasten the blade with a screw or other type of mechanism. The quick-release option is more popular simply because it makes it must easier for users to operate even when they are new to using the tool. There are two types of blades used in jigsaws that are the most common: T-shank and U-shank. Of the two, T-shanks are used more often and are designed to be used in the quick-release style of jigsaw. U-shanks will need to be secures to the saw with a retaining screw to ensure safety. These two blades are not interchangeable so whichever style blade your jigsaw uses will always have to be the kind it uses. There are some jigsaws available that can be used with both styles of blades. Just check the specifications on your particular model to ensure you get the proper type of blade. Orbital action is the way the jigsaw blade moves. Many jigsaws have blades that move only in an up and down motion. Orbital action means the blade moves forward at an angle. Blades that move in an orbital action can be adjusted to fit the type of material they are going to be cutting. Variable speed option: Controlling how fast your blade moves is very important depending on the type of materials you will be cutting through. A general rule of thumb to follow is that the harder the material is (i.e. metal) the slower the blade needs to move while softer materials (i.e. wood) cut better at high speeds. Most jigsaws offer variable speed controls enabling you to adjust the speed to the particular cutting job you are doing. Dual-bevel capability: this feature allows angled cuts in either direction without having to go through the hassle of flipping the piece you’re working on. Precision Roller Guides: Accurate cuts are much easier when precision roller guides are used. This is a great feature when you’re working on a project where there is no room for error. Knob Style Auxiliary Handle and 360 degree rotating blade: this type of handle make precision steering much easier when you are working on scroll cuts or using it for crafting and the 360 degree rotating blade is excellent for intricate detailed cuts that you might make in furniture or other craft pieces. Bevel (pivot) adjusts: this feature is what enables you to cut at 45 degree angles to get decorative beveled edges. Depending on your particular model, this adjustment may be easy to do or may require tools. Guide light: You may not think a guide light is a big deal if your work area has lights or even if you have shop lights, but that guide light makes seeing your cu line so much simpler most people who try a jigsaw with a guide light don’t want to go to one that doesn’t have it. These lights are usually LED and make cutting straight lines, intricate designs or stenciled marks much easier and precise. Dust Blower: Having a jigsaw that collects or removes the dust that can build up in the path of your jigsaw is a big favorite among users. These blowers keep your cut marks and stencils from disappearing under a layer of sawdust which can mess up your cut. Some models of jigsaws have a port for a vacuum that can be attached that will also do the same thing. Jigsaw Case: This is not necessarily a feature but you will find that jigsaws with cases tend to last longer due to the protection they provide when the saw is not in use. Safety Switches: When it comes to safety, finding jigsaws with rocker switches are the safest. There are some styles that have switches that keep the tool turned off when the trigger is pulled. If you have younger children around, using these safety switches and keeping the jigsaw put away in the case when not in use can accidents and injuries. Air Stop Brusher: Another feature that some jigsaws have is called an air stop brusher. This is a protective measure that protects the motor from damage by preventing operation when the brushes of the jigsaw are worn. Metal Gear Housing: this type of housing protects the motor during heavy use and ensures a long lasting performance. Laser Line: Laser lines are nifty little things to have and make your cut lines more accurate. It projects a red lighted line onto your project to help with getting more precise cuts. Lighted Plug: a lighted plug is great for letting the user know with just a look if the tool is live or not. If the light is on, the tool is on. Rubber Cord and Cord Storage: for better flexibility and maneuverability rubber cords are a great feature if your jigsaw offers them. The cord storage is a handy feature that keeps the cord neat and out of the way when transporting or when it’s not in use. Money Back Guarantee and Warranties: It is important that the jigsaw you purchase offers a money back guarantee and also a warranty in the event you are not happy with its performance or in case something goes wrong. With a good warranty in place, you know that if something goes wrong, it will be replaced or at the very least, fixed. A money back guarantee is typically 30 days or so and gives you a chance to try the jigsaw out. If you are unhappy with it, the guarantee allows you to return it according to their instructions and get your money back. Be sure to keep your receipt for this reason and put it in a safe place in case you need it for repairs or returns. When you purchase a jigsaw it will come with a blade but you will inevitably have to buy a replacement blade or buy blades for cutting other types of materials at some point. You can buy them separately and get many different kinds if you cut a lot of different materials. The kind of blade you need depends on what you are going to be cutting. The thickness if the blade will correlate with the thickness of the material you are cutting. Thinner blades generally provide a cleaner more accurate cut for curves and designs. If you use a blade that is not right for the material you’re cutting the blade could break. Jigsaw blades can be made from many different materials. These include high-speed steel, high-carbon steel, bi-metal, and tungsten carbide. High-speed steel – The steel blades ate good choices for cutting lighter weight metal and softer woods such as pine, cedar and mahogany. Bi-metal – These are suitable for heavy cutting jobs and are very well suited for hard-to-cut metal and hardwoods such as oak, walnut and hickory. Tungsten carbide – These types of blades work great for ceramic and masonry type products. TPI stands for “teeth per inch” and it is how the teeth of a blade are measured. The amount of teeth a blade has will determine which type of material it is best suited for. It will also determine the speed of the cut and how fine of a cut it makes. In general, the fewer teeth (a low TPI) will be the best for softer materials like paper, wood and cloth. Anywhere from 6-20 is considered a lower TPI. These types of materials will cut fast and be a rougher cut that can be sanded later on (if it’s wood) Your harder materials like steel and ceramic will need a finer cutting edge and a higher TPI of around 14-36. This will also provide a slower cut as well. Another factor that determines the speed and roughness of your cut is the type of tooth set it has. They will either be milled or ground. Milled tooth sets are great for faster, rougher cuts and are blunter. Ground tooth sets have a finer point and make finer cuts with a slower action. They are also sharper. Ground sets tend to wear out more quickly than milled sets. The jigsaw type, the power it has and the type of blade it uses will change with the project you are working on there is a rule of thumb that you can use to help you determine which type of model fits the types of jobs that you will be using it for. Some professionals that use jigsaws often may opt to get a few different models to accommodate the different cutting jobs they will be doing. If you’re looking for a jigsaw that will be good for everyday type tasks that are not needed very often a cordless model would work well for you. The fact that it is very portable allows it to be easy and convenient while still getting the job done. Cordless models are not as strong as corded and pneumatic but they can handle light to medium tasks well. If you like, you can buy extra chargeable batteries to replace one while the other is charging so it is never out of commission if you need it. If you’re going to be doing projects often or for long periods of time or you will be working with thicker material, a corded jigsaw will be a great choice for you. They weigh less than cordless varieties so for long jobs they’re perfect, as they will not cause work fatigue. Corded jigsaws tend to last longer and have a more durable design than cordless as well. Even though pneumatic jigsaws are the least portable of the three due to using an air compressor, these can be very powerful tools that are much safer in the workplace because they are powered by air rather than electricity. You can still accidentally cut the cord of a pneumatic jigsaw but since it’s not electrical there is no danger of electric shock or fire. This makes this type of jigsaw great for workshops where the projects done are in one place. They’re not really suited for around the house type projects, but this is where having a couple of different styles can really come in handy. When it comes to choosing which jigsaw you want, reviews and buyer’s guides such as this one can be invaluable tools for you so you know exactly what you’re looking for. Many people look at customer reviews as well but they are not always as accurate as reviews from review sites. You will get a lot of personal opinion of course in a customer review and they do have their place. If you look at a jigsaw with a lot of good reviews and just a small handful of lower ones, you can be assured that you have a good choice and will more than likely be happy with that model.